The Speed Sled Classic allows you to perform short distance sprints to boost leg power and stride length. The sled platform can be loaded with any standard Olympic weight plate. Constructed of 100% steel. The Speed Sled Classic comes with a nylon speed harness and dual 7 ft nylon cords. The harness fits waist sizes up to 46 in or shirt sizes up to 2XL. NOTICE: The weight post does not have a covered end cap. So if you are working with youths, you might consider our other sleds or purchasing a plastic cover. MINOR ASSEMBLY REQUIRED. 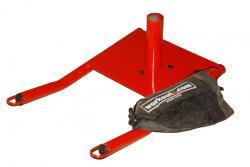 When your sled arrives, the steel post will need to be attached with three hex bolts, which are included. Insert the post into the opening in the platform from the bottom up. Then tighten the bolts from the top down with a hex tool (not included). If assembled correctly, the tightened bolts will be flush with the sled platform.